The Hope Group or call our Program Manager Charlotte Tankersley at (720) 745-9252. If you or someone you know is feeling suicidal or is in crisis: please contact Colorado Crisis Services at 844-493-TALK (8255) or text TALK to 38255. You can also reach them at www.coloradocrisisservices.org. You can also call the National Suicide Prevention Lifeline at 800-273-TALK (8255), reach the Crisis Text Line by texting HOPE to 741-741 or visit www.imalive.org for online text chat. Don’t give up, please reach out. Hope and help are available 24/7/365. 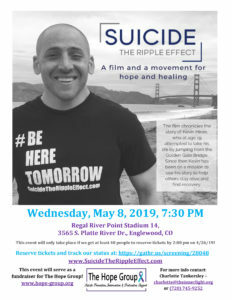 Come to Our Movie Screening May 8th, 2019!